The Robert Dover’s Cotswold Olimpick Games returned in 2018 with a new and updated event, with something for everyone. The new Robert Dover’s Games Society, chaired by Tom Threadgill, had been hard at work to make sure the funding was raised to make the 2018 games a reality (after the 2017 event had to be cancelled). With the history of the event going back to 1612 it was seen as important that this traditional event was supported so it carried on. The town of Chipping Campden, and surrounding area, supported this event by raising the money through sponsored music event at the Volunteer Inn, limited edition games medallions and other events. Local companies again sponsored the event with special thanks to Hayman Joyce Estate Agents who were the principal sponsor. splat the rat, beat the buzzer, coconut shy, Harry Taylor’s Morris, Backswords, Coventry Corps of Drums Rozie T’s Dance Academy and a music stage featuring General Jones, Greg Brice and others. The main arena at the bottom of the hill was were the Championship of the Hill, Champion of the Hill and the Shinkicking World championships would take place. The event was started with the arrival of Robert Dover and Endymion Potter and the Scuttlebrook Queen and then words from outgoing chair Graham Greenall and new chair Tom Threadgill. 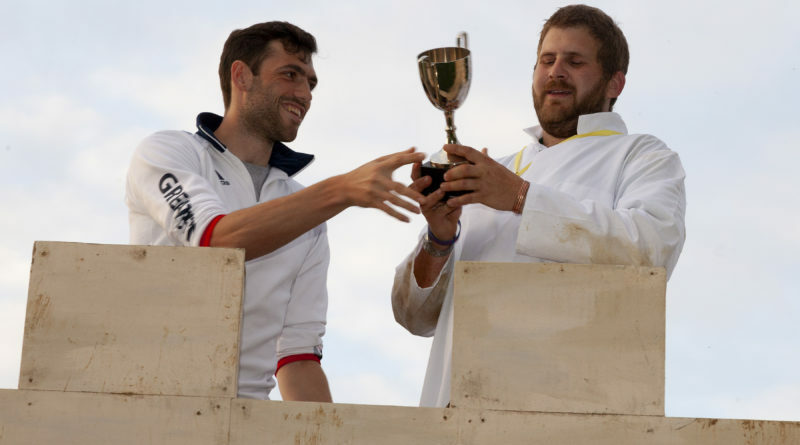 Then the games were officially opened by Olympic Gold Medallist and World Champion (Rowing – Eights) Matt Gotrel. In the lower arena the Cavalry of Heroes demonstrated their jousting and horsemanship hills and then we had a display by Fire Eaters. Then the main events started with The Championship of the Hill competed for by four teams – Jailbreakers, Returning Heroes (the 2016 winners), Chill Out (Chipping Campden Baptist Church) and for the first time Chipping Campden Hockey Club. The four events in the championship were the ski race, sack race, wheelbarrow race and finally the water race. After the lead moved between the teams the Chipping Campden Baptist Chill Out team were declared the winner. Then the teams had a traditional ending by soaking the other teams from the water in the dustbins, before sliding up the very watery course, with added washing up liquid! 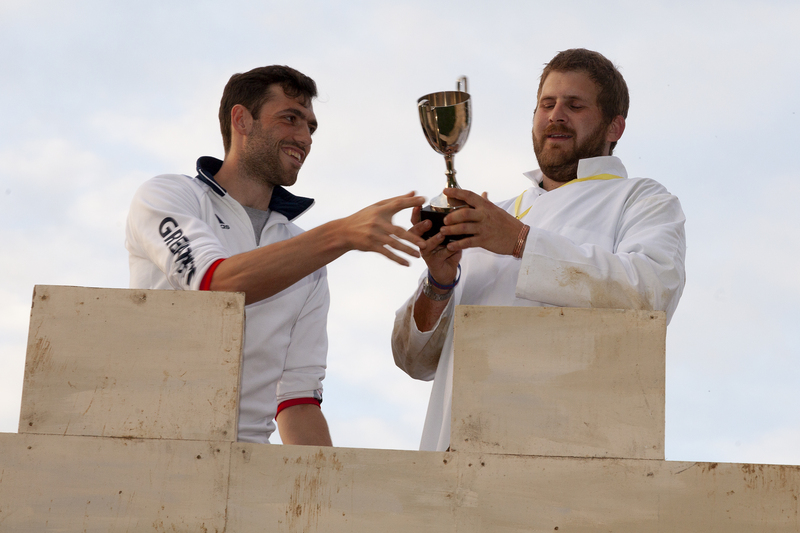 The winning Chill Out team were presented their medial by Matt Gotrel. Then the main event took place which was the Shinkicking World Championship. The elimination round was between Dave Hill and Kevin Rey (a German who part of a German Reality TV group filming the event). This was a close battle with the more experienced Dave Hill overcoming his opponent by two falls to nil. So then the final, after a short break was between Dave Hill and existing champion Adam Miller (who won in 2014, 15 and 16). Two sticklers (umpires) were in attendance to judge if the felling of an opponent was done in an approved banner (i.e below the knee in the shin area). After a couple of falls due to slipping the two opponents both had an accepted fall of their opponent. But sadly, at that point challenger Dave Hill had to retire injured. The final event in the main lower arena was Champion of the Hill an individual event between 5 contestants. This included putting the shot, standing jump and spurning the barre along with throwing the hammer (this year substituted by throwing a fencepost thumper). After the 4 events Mica Pieri was declared the winner and was presented with his medal by Matt Gotrel. The finale of the event was the lighting of the beacon by the Scuttlebrook Queen, assisted by the Fire Eaters and then the torchlit parade down the hill led by the Coventry Corps of Drums, with The Sambassadors of Groove bringing up the end of the procession of hundreds of people. Then the event was finished off with music from Get Carter (along with Pyro techniques) in the Main Stage with a hog roast supplied by Robert Walker and the bar by The Volunteer Inn.